The 2018 Chinese New Year “Year of the Dog” begins on the 16th February 2018. The dog occupies the eleventh position among the Chinese zodiac animals and is a symbol of loyalty and honesty. People born in the Year of the Dog possess the best traits of human nature. They are honest, friendly, faithful, loyal, smart, straightforward, venerable and have a strong sense of responsibility. 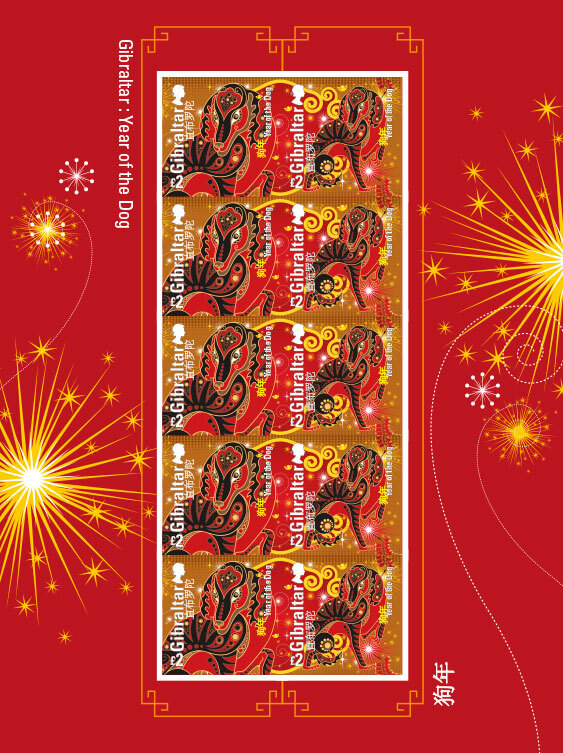 Chinese New Year is the most important of the traditional Chinese holidays and the Year of the Dog stamps are the sixth edition of the successful philatelic series issued by Gibraltar. All Gibraltar zodiac stamps since the first issue released in 2013 have been designed by the same artist in order to keep the same look and feel of the stamps.